Another month has passed and we are closer to our wedding. CZM has been counting down and stressing me, less than 100 days to go! We did our pre-wedding photoshoot and it was an extremely tiring day! I failed to do the 新娘抱 (carrying the bride) and it has become one of CZM's regret. Besides that, everything went smoothly thanks to my dad for driving us around and CZM's brother for carrying a bunch of helium balloons in NTU while waiting for us to arrive. Hahaha. You can read more about how we manage our finances here. 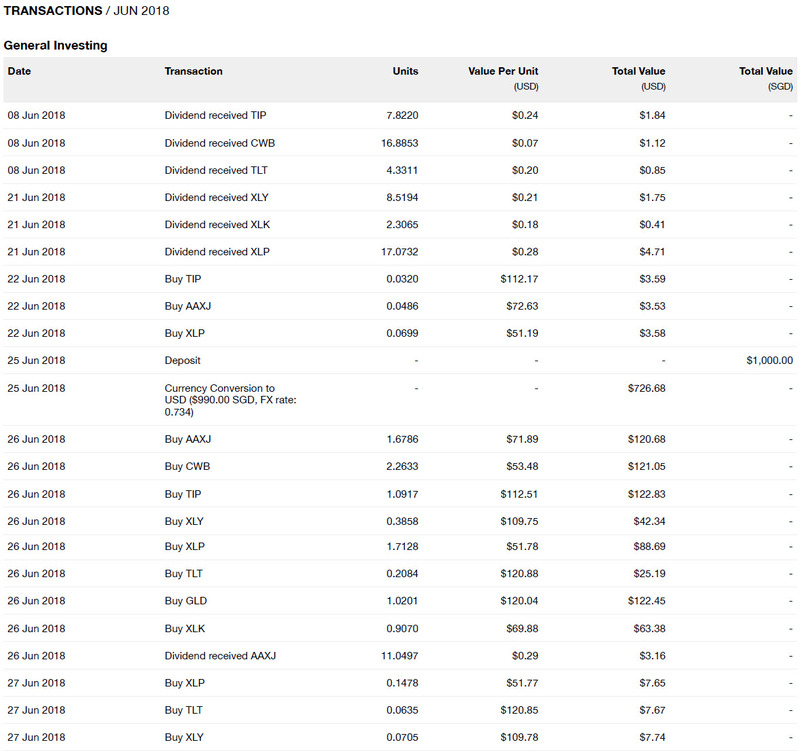 Removing our shared expenses which come out of our mutual fund (KPO Expense Fund), my expenses for June would be $3,419.11 - ($2,274.09 / 2) = $2,282.07. Gown - We made another payment to the bridal shop (Rico-A-Mona) after our pre-wedding shoot. I believe the last payment will have to be made during the collection of photos. 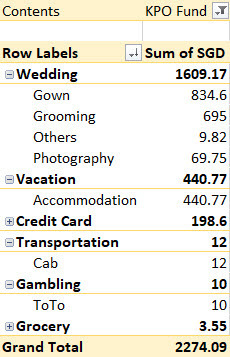 Grooming - $105 (50% deposit) was paid to a MUA for my mum and sisters' makeup for the actual day. $430 was the "scam" I blogged about in last month expense update. $70 was for CZM's nails and $90 for the MUA on the pre-wedding shoot. Photography - We spent $58.70 on 12 helium balloons including a $35 delivery fee from Give Fun >.< Once in a lifetime! Booked accommodation for our USA honeymoon. Paid the annual fee of $192.60 for Citi Premier Miles and got 10,000 miles in return. The cheapest way to buy/earn miles. Specialized spending earns 4 miles per dollar which translate into $2,500 of spending before one earns 10,000 miles. Trying our luck on ToTo - the fastest way to become a millionaire. lol. Applied for May SSB to build the bond ladder so that we can get higher interest for DBS Multiplier account - DBS Multiplier + SSBs + Joint Account = Higher Interest! 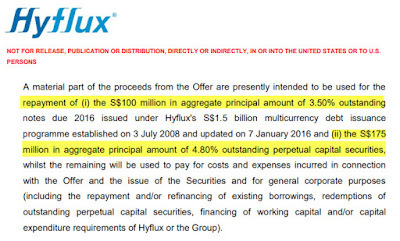 This should not be a new news anymore, Hyflux defaulted its coupon payment for its 6% perpetual securities and has applied for a debt reorganization and in the worst case scenario, it may even go bankrupt. Unfortunately, I realized that a few of my colleagues are/were holding either the shares or the perpetual securities. They were under the impression that it is a monopoly and is back by the government so nothing will go wrong? I got curious and went to take a look at its Annual Reports over the years. To my horror, there was an obvious red flag! 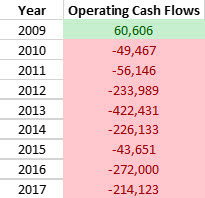 Turns out the company has been reporting negative operating cash flows for the last 8 years! In my opinion, this is easily one of the most important numbers one should be looking at. Operating Cash Flow (OCF) as defined in Investopedia is the amount of cash generated by a company's normal business operations. Companies can report positive net profit with negative operating cash flows which may not be that intuitive. 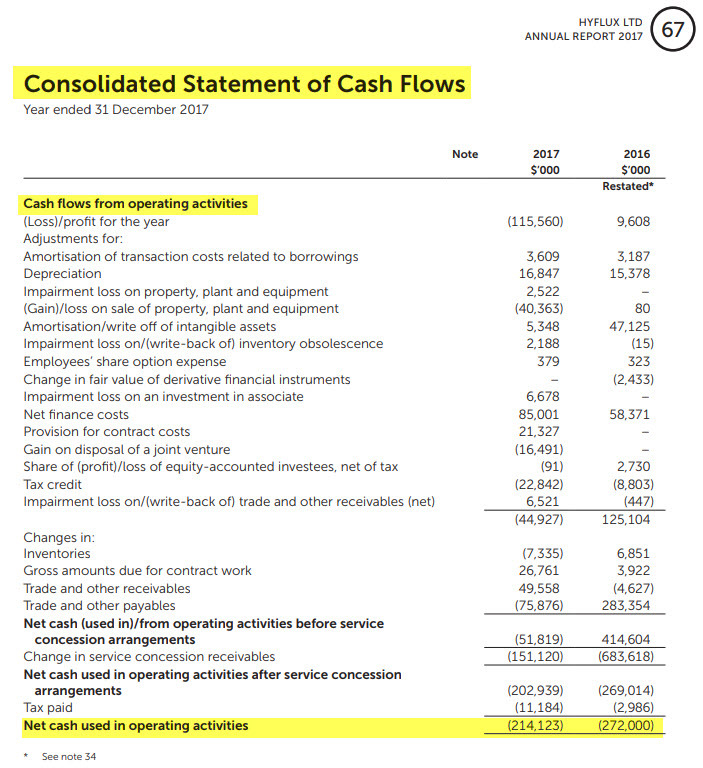 You can read more about it from Quora - Why is a company's operating cash flow negative but its net profit is positive? You will be able to find it in the cash flows statement. 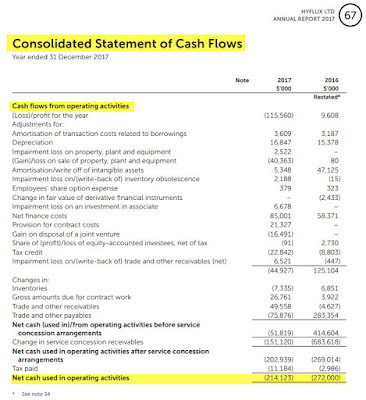 Look specifically at the net cash used in operating activities. 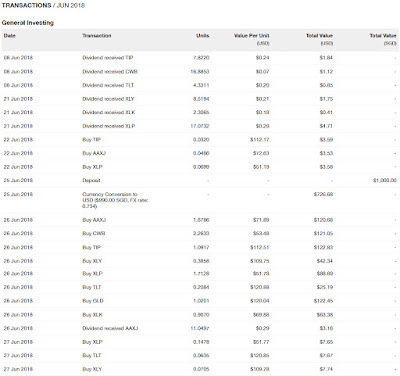 This is a list of all the retail bonds trading on SGX. 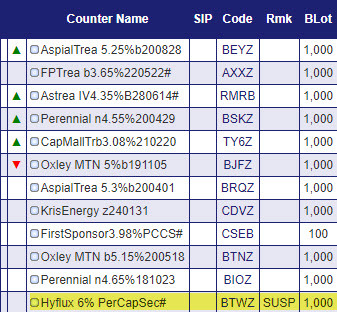 At one glance, you will see that Hyflux has the highest yield (high risk = high return). 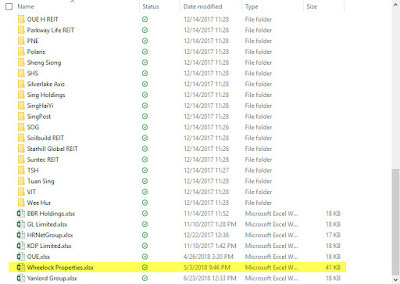 I went to search for the prospectus to find out/determine how they will be using the money. 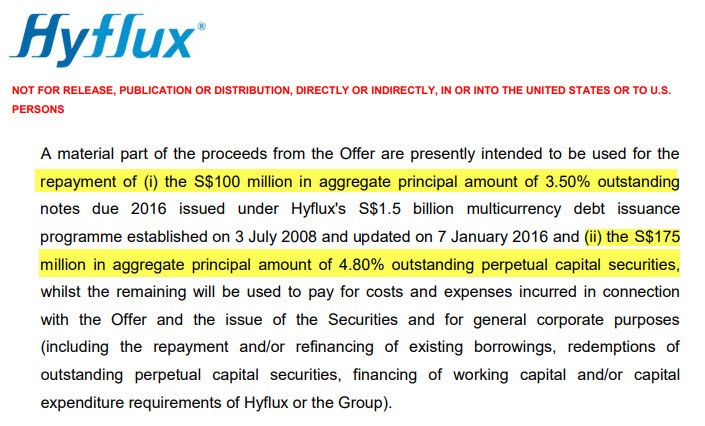 This is a very unfortunate event for the investors of Hyflux and one can only prepare for the worst and hope for the best. As for the rest of us, I hope that this can be a learning lesson on what kind of company to avoid. Hi everyone! CZM was telling me that it has been a while since I blogged, mostly due to the World Cup among other things. As a result, this post has been in draft mode for the longest time! 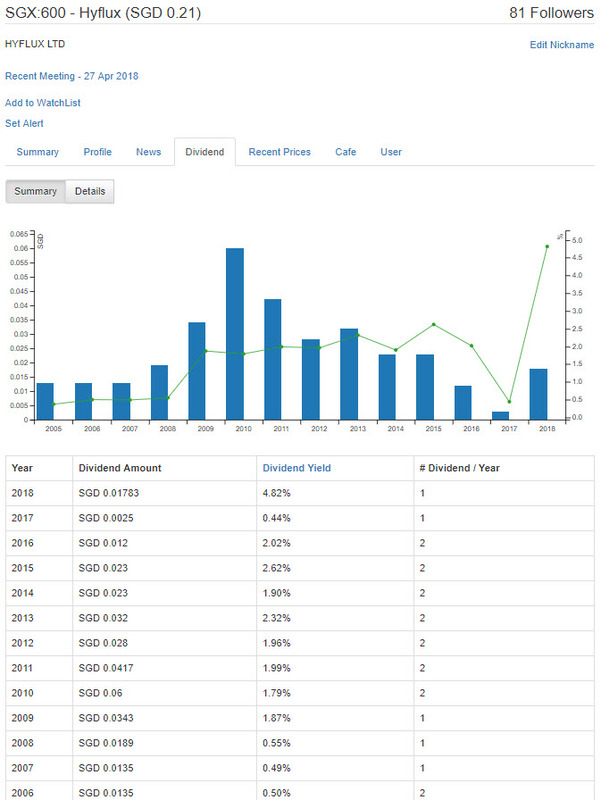 One of Our Goals is to have a one million dollar portfolio with a 5% dividend yield before 40 and I have a spreadsheet that forecasts how fast we will be able to meet that goal in a perfect/ideal scenario such as the market does not crash, we continue to invest with positive returns, etc. When I first made the spreadsheet, the forecasted age was 37 (we are currently 28 years old). However, over the last 2 years, we have invested aggressively (more than the forecasted amount) + increased in salary, the latest forecasted age is 35 years old (7 more years). I have blogged about this and shared the spreadsheet, you can refer to this post for more information - When can I be a Millionaire? At the end of 2017, I did a Portfolio Performance review and it turns out that we did much better than what was forecasted - Our target for 2017 was $217,340 and we had $293,858 by the end of the year. For 2018, our target is $357,268 which can be achieved by investing $42,840 + 7% return on $293,858. So how did we do so far? Our XIRR for 2018 is -9.70%. 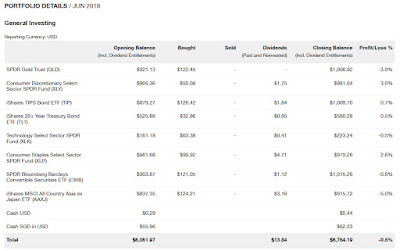 Our portfolio which is property/REITs heavy took a hit when the cooling measure was announced >.<" As you can see, the capital flow for this year is $57,557. Capital flow is the amount of capital that is being injected or withdrawn from your portfolio and dividends collected are considered as capital withdrawn. 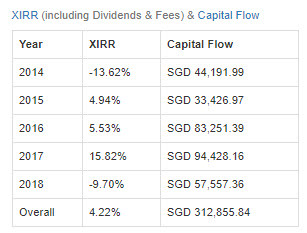 In addition, some of the money ($6,000 to be exact, not included in the capital flow) was invested into StashAway instead of our SGX portfolio. 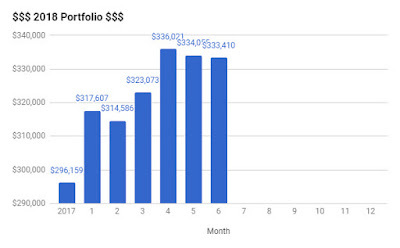 The current value of our portfolio is $336,141. Although we have met and even exceeded the required capital injection, we are nowhere near our target for the year :'( On the bright side, we still have another half a year to go! On a side note, congratulations to the Wheelock Properties shareholders! Although the offer is way below book value, the return should be quite decent (depending on your entry price). We were looking at it on 3rd May 2018 but decided not to buy in the end. 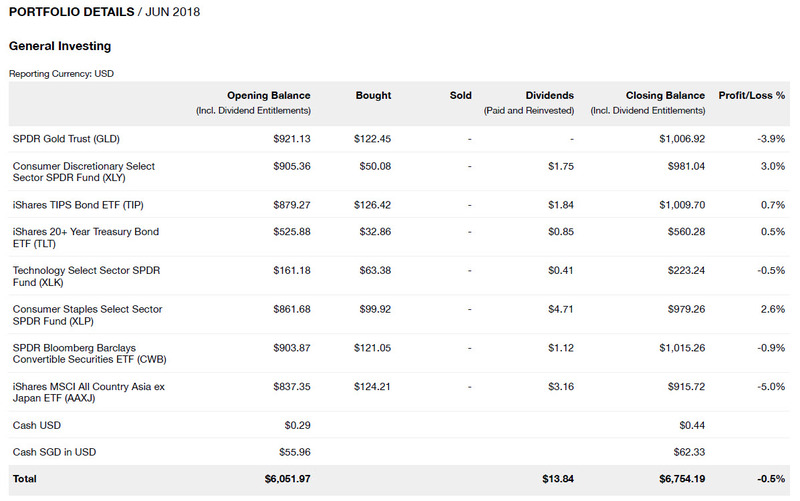 In hindsight, based on our May purchases (Portfolio - May 2018), it seems like Wheelock Properties would have been the better deal. KPO jelly now. lol. Your Money or Your Life? You will probably only encounter this in either scenario - a robber pointing a gun/knife/banana at you or reading the book by Vicki Robin. This has always been one of the books I wanted to read because I was first introduced to it by a colleague who quit his job (without another job offer) after reading this book a year ago. He was totally fine with taking a pay cut to do something of interest or even drive Uber/Grab (when Uber still existed). 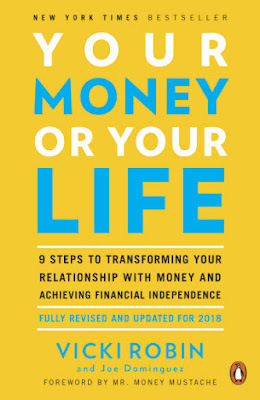 Regardless, I have just finished the book and it did give me some new perspectives on money/life but I will still be keeping my job. lol. Let me share some of my favorite quotes/important concepts in the book. 1. "Money is something you trade your life energy for. ... The only real asset you have is your time. The hours of your life." Nothing is free in this world except for the air you breathe! "When you are not paying for the product you are the product" - this has become a pretty common saying when it comes to the services (social media, email, etc) provided by the various technology giants (Facebook, Google, Microsoft, etc.). So why are the employers paying for your salary? They are buying/paying for your skills, knowledge, experience and most importantly, your time. One of the main concepts in the book is finding out your actual hourly wage aka life energy. Typically, people would take their monthly salary and divide by the total number of hours (assuming 8 hours a day, 4 days a week - 160 hours). The book attempts to quantify it differently by taking into various aspects such as the commuting hours + overtime hours (if you are not paid) + the different expenses one would incur due to the job (e.g. working clothes, outside food, etc.) and you will see your hourly wage reduces drastically. One classic example is the Big 4 auditors straight out of school (a few years ago, it was $2,900 - $3,200 per month before CPF deduction, not too sure about the current rate) where one can work till 12/1 am every weekday and work on almost every weekend. The actual hourly wage could even be lesser than those part-time workers. That was the life CZM was leading. Do read the book to understand more! In addition, earning more does not make one more happy. The survey which was conducted by them indicated that almost everyone wished/wanted 50% more than what they have currently. I don't know about you but both CZM and I can definitely relate with this. Back in the university, we were thinking $5,000 would be a lot, more than enough but when we have really gotten it, after deducting CPF and the various expenses, it feels meh and we start to think if only we have more. This then becomes a vicious cycle when one continues to chase for more... Having said that, we do understand that there are many other people who are less fortunate and do not earn as much as we do and we should be contented with what we have. 2. "Life energy is all we have. It is precious because it is limited and irretrievable..."
It may sound philosophical but it is the hard truth. Everyone lives in a different way/scenario but the only constant we all have is time. Every dollar that you spent can always be earned back but every second that has passed is irreversible. Our parents are aging every single day with more and more white hairs and wrinkles as the days passed. Those with children/baby will see them grow bigger/older and how many of their first (crawling, walking, speaking, etc.) have you witnessed/missed while trading your life energy away for money? That is why we are so aggressive when it comes to building wealth/portfolio for earlier financial independence/retirement! At the same time, we are enjoying life/ourselves by having good food and travelling overseas almost every year. There is more to life than just money. 3. 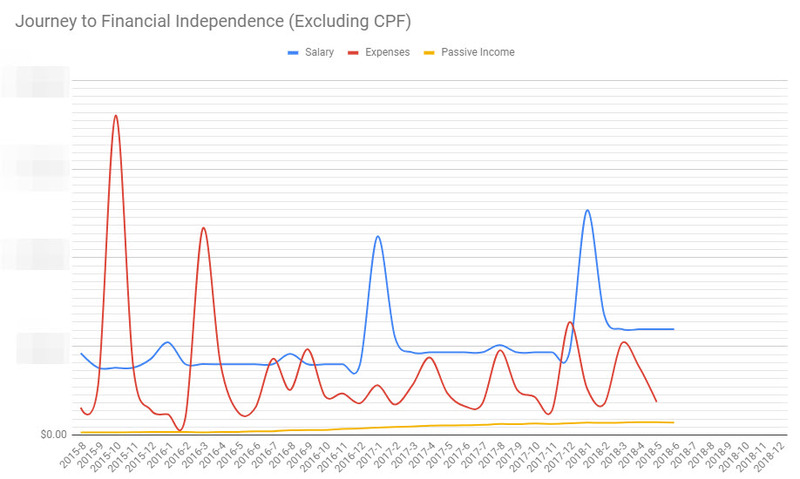 "Your savings rate is one of the most important factors for achieving Financial Independence." This has been discussed/brought up multiple times by many books, bloggers, everywhere but I shall reiterate this point again. Using the inflated median salary ($4,232 including employer CPF contributions which do not make sense to me) provided by MOM as an example, the actual salary will be about $3,617 and the take home salary will be about $2,893. The "Difference" in percentages would be the investment returns that will be required for one to achieve the same amount of savings as increasing the savings rate by an additional 10%. For example, person X who is saving 20% would need a 50% return on investment to have the same amount as person Y who is merely saving 30% and not investing at all. As you can see, saving an additional 10% would be much more significant than achieving a 10% investment return simply because the portfolio is smaller. Original Source by J.D from Get Rich Slowly: How Much is Enough? Knowing how much is enough/sufficient is the other important factor. The above graph is a visualization of the saying "money can't buy happiness". Once you are at the point of "ENOUGH", spending more money will not make you feel fulfilled/happy anymore. A simple analogy will be going for a buffet - once you are full, continuing to eat will only make you feel unwell/bloated or even puke. 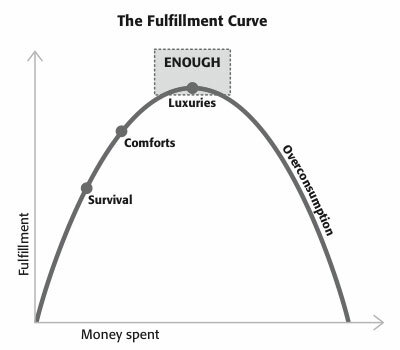 Unfortunately, the fulfillment curve is kinda abstract and is different for everyone, hence one will have to figure it out yourself. Personally, I like the "wall chart" that was taught in the book and I came up with my own spreadsheet to do that! On the flip side, it requires one to track their expenses. The idea is simply - track your salary, expenses and passive income. Once your passive income touches/exceeds your expenses, you would have reached the "crossover point" which also means financial independence. The book uses a 4% withdrawal rate based on the investment asset/portfolio hence I have prepared 2 copies of the spreadsheet - one including CPF and the other excluding. 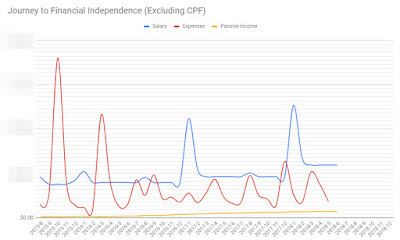 Although there will be CPF life once you reach retirement age which contributes to your passive income, the more conservative approach is to exclude CPF totally. lol. CZM and I are definitely not ready for that! We still want to eat good food and travel around the world! Hahahaha. Based on the statement (30 June 2018), we gain $203.59. 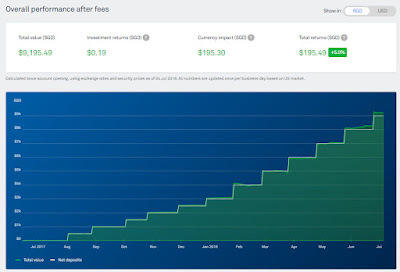 As of 4 July 2018, we gain $0.19 from investment returns with a huge currency impact of $195.30. Not good! In our last monthly update, I said that I would have preferred the USD to be weaker because we will be going to the US for our honeymoon. Weaker USD meant that we can convert the same SGD for more USD to invest too. You might be interested in last month update too - StashAway May 2018.